When a file is deleted from a hard drive, the operating system does not erase it from its original location straight away. Rather, it is only flagged as deleted, which enables it to be overwritten by new data. Data recovery solutions scan hard drive partitions for such sectors flagged for deletion, and attempts to recover data from them. That being said, not all deleted data from hard drives may be recovered successfully. Even simple actions such as browsing the web can store cookies and cache that may overwrite the deleted data you are hoping to retrieve. So, unless you scan the drive, you can’t be sure whether a particular file is recoverable or not. Recuva is a decent data recovery software for Windows that allows you to scan and recover deleted files and folders for free. It supports quick and deep scan modes for recovering deleted files from internal and external storage devices. The software even allows users to scan specific folders and recover data. However, it is not possible to scan only particular folders for lost or deleted files. The directory structure is only a logical representation of the stored files, as provided by the Operating System. The actual data can reside anywhere on the hard drive; even be fragmented across several sectors. It is only after scanning through all the disk sectors on which a particular file is fragmented across, that a certain recovery solution can list the file in the scan results. The results may then be filtered by file location or type. Data recovery solutions for OS X usually provide a set of common features, such as disk scanning (quick and deep scan modes), listing of scanned files, file preview, and file recovery. As far as data recovery is concerned, most of the popular recovery solutions give almost similar results. The difference lies in the user experience, speed of disk scan, and additional features offered by each of them. Then again, not all recovery solutions can restore the file in the exact same state as it was before deletion. When a file is deleted on Mac, the metadata associated with it (including original file name and other attributes) might be lost unless a backup is taken. Note: To maximize the chances of recovery, it is recommended to use a different disk partition to save the recovered files, than the one in which it was originally stored. Disk Drill from CleverFiles is a data recovery software that helps you restore data from storage drives under different critical situations. Its proprietary scanning and recovery solutions support a comprehensive list of disk formats, including HFS, HFS+, FAT, FAT32, exFAT, NTFS, EXT3 and EXT4. Disk Drill can filter the scanned results according to different categories, such as photos, music, videos, documents, etc. And you can even preview the files before recovering them, just to make sure you recover the right one. Recovered files may either be saved to hard drive, or mounted as a virtual drive on Mac. It uses three additional features that help protect valuable data — Guaranteed Recovery, Recovery Vault and S.M.A.R.T. Monitoring. Guaranteed Recovery keeps a copy of every file that you put into Mac’s Trash. Recovery Vault keeps track of the metadata in deleted files, so that you can quickly restore the file exactly in the state in which it was before deletion. S.M.A.R.T. Monitoring tracks hard drive activity and issues warnings in case of hard drive problems, so you can backup your valuable data before it fails. Disk Drill’s scanning method is faster compared to the other recovery solutions. It also uses the native Preview feature of OS X to preview recovered files, which might be more preferable than third party previewing tools. It features safe recovery options like “Backup Into DMG Image” and “Remount Volume as Read-Only”. “Backup Into DMG image” option allows you to back up the entire hard drive onto a new drive as a virtual DMG image, while “Remount Volume as Read-Only” option prevents deleted data (on non-system drive) from being overwritten during the scanning process. The software helps to recover lost partitions and restore data from them with options like Universal Partition Search, Scan for Lost HFS+ Partition and Rebuild HFS+ Catalog file. Disk Drill is probably the only recovery solution on Mac that allows you to recover unlimited files for free (using Recovery Vault and Guaranteed Recovery). The Basic version of Disk Drill is free, which lets you to scan and preview lost and deleted files. It even allows you protect your data with Recovery Vault and Guaranteed Recovery features turned on. But, if you want to recover data that was deleted before these features had been enabled, you need to upgrade to Disk Drill PRO. There is also an Enterprise edition available for commercial use. Disk Drill is one of the best options available on Mac if you want to recover accidentally deleted data from healthy hard drives. When the health of your hard drive is poor, you may start to notice that whenever you try to open files or apps, OS X may throw unexpected error messages, or that the system becomes unresponsive, with the mouse pointer continuing to spin forever. Your Mac may even refuse to start up sometimes. Such behavior might indicate directory damage or, in some cases, even a pending drive failure. Disk Warrior repairs damaged disk sectors and directories, recovers files in good condition, and rebuilds damaged directories as clean and error-free ones. Disk Warrior verifies the repaired disk sectors to ensure that it’s error-free. Once verified, the software replaces the recovered data into the repaired sectors in a fail-safe manner. Disk Warrior allows you to preview the repaired state of the disk, before the repair operations have actually taken place. You can even compare the disk in its damaged state and repaired state to ensure whether the missing or corrupted items can truly be recovered. Apart from repairing disk errors, the software diagnoses connected hard disks regularly for common file errors such as file paths, permissions, invalid plists, etc. It also uses S.M.A.R.T. technology in order to monitor disk health in real time. Disk Warrior may directly be purchased online for $119.95, which would be delivered as a digital download as well as on a Flash Drive. A Disk Warrior Upgrade from an older version costs $59.95 and is delivered on a flash drive only. Disk Warrior is ideal for repairing bad sectors on your hard drive and recovering data from corrupt hard drives. It can protect you against data loss when your hard drive starts showing symptoms of failure. Sometimes, your hard drive could crash suddenly without any prior warnings. And it can be very difficult to recover data from a disk drive that has already failed, but not with Data Rescue 4. Data Rescue is a hard drive recovery software that allows you to recover data from crashed, corrupted, accidentally reformatted or non-mounting hard drives. It can also recover previously deleted, damaged or missing files. In case of hard drive failure, the drive gets corrupted, unreadable and unmountable by the Operating System. Data Rescue makes data scanning and recovery from such corrupted drives possible by creating a custom bootable environment called BootWell outside the main Operating System. A BootWell drive is a bootable USB flash drive created by Data Rescue that your Mac can boot into, outside of OS X. Once inside the BootWell environment, corrupted disk drives that were unmountable on OS X, can be scanned for file recovery. In addition to Quick and Deep scan modes, Data Rescue has a Deleted File scan option to search specifically for deleted files. With a BootWell drive, one can attempt to recover data from hard disks when the system refuses to start up or drives become unmountable on OS X. If you need to recover data from a hard drive which has already crashed, or is unmountable on OS X, Data Rescue is the one recovery solution you would go for. Besides these three popular recovery solutions, here are a few more alternatives you may want to try out. 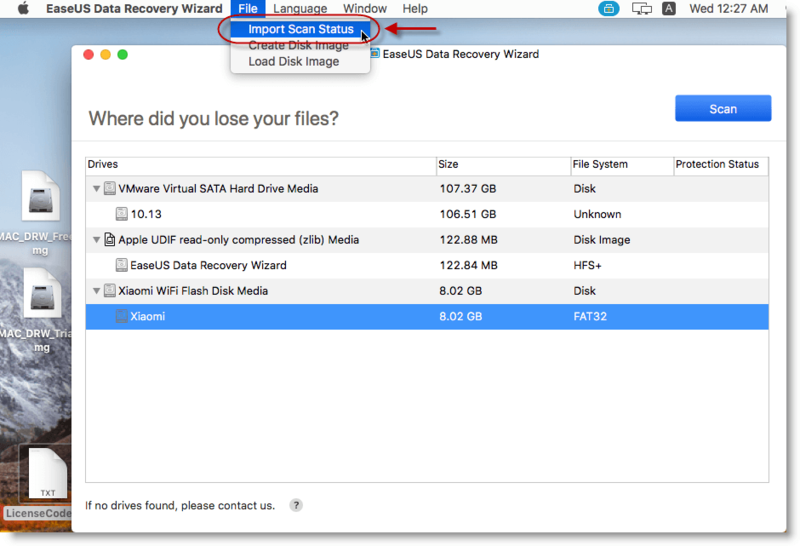 Data Recovery Wizard from EaseUS is an easy-to-use data recovery solution for Mac, which allows you to recover lost, inaccessible and deleted data from your Mac or external storage device. With two different scanning methods — Normal Scan and Deep Scan, the software helps you to recover data from various scenarios, such as accidental deletion, system crash, lost or deleted partitions, formatted hard drive, etc. Data Recovery Wizard is available in both Free and Pro versions. The Free version supports all features of the Pro Version, but has a recovery limit of up to 2 GB. For unlimited recovery, you can purchase the Pro version for $89.95. Stellar Phoenix Mac Data Recovery can recover lost or deleted data after disasters such as drive formatting, accidental deletion, malware attacks, data corruption and other similar issues. The application can recognize over 122 distinct file types and recovers files on Mac by matching signatures. And when the files are recovered, they are restored with their original file names, so that you can easily identify them. It has a RAW Recovery feature that can be used to recover data from severely corrupted disk volumes. Stellar Phoenix supports data recovery from multiple file systems, including HFS, HFS+, FAT, NTFS or ExFAT. Just in case your Mac is not able to start up, Stellar Phoenix includes a bootable System Startup DVD, which helps you to gain access to the system in order to scan and recover lost, deleted or corrupted data. You may also create a system image to back up all your data when your disk health is good. 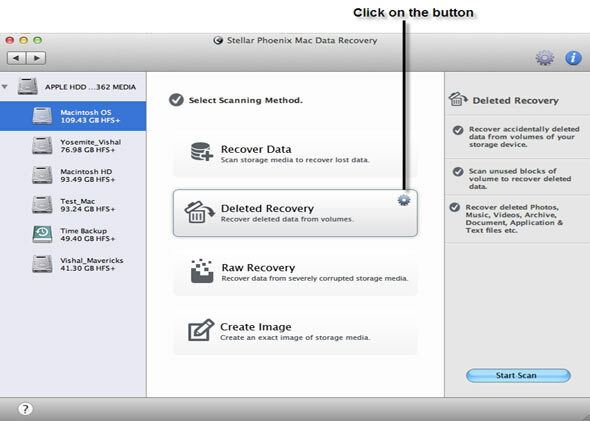 When data is lost or deleted, Stellar Phoenix helps you restore the system image and recover it. Stellar Phoenix is available as a free trial which includes scan and preview features. To actually recover lost and deleted files using Stellar Phoenix, you need to purchase the full version for $99. To get the additional bootable recovery CD along with the software, you need to pay $119. Stellar Phoenix also has a Platinum Edition that includes additional disk optimization features like repairing disk permissions, directory rebuilding and more features similar to the ones offered by Disk Warrior. The Platinum Edition costs $125 for the software, with an additional $20 if you want to opt for the recovery CD. So, which of these data recovery solutions is right for you? That entirely depends on how you wish to use each of them, and under what situation. If you think that we have missed a recovery solution that was worth mentioning, let us know in the comments below.